Mark Hildred (left) on the podium. Boston Squash Club’s Mark Hildred has had more success on the European Masters circuit, reaching the final of the Czech Masters over 50s event in Prague. Mark was also a finalist in the Italian Open Masters in the autumn and the latest result should see him retain his top 10 ranking in the European Masters circuit. The tournament was a 32 draw, but Mark received a bye in to the second round, in which he beat a Czech opponent 3-0. The competition became quite tough at the quarter-final stage, with Mark up against the Swiss number one Stefan Grundmann. Mark started and finished very strongly and came through the match 3-1 (11-3, 11-9, 9-11, 11-1). In the semis, he faced the number two-ranked German Marko Kruse. Mark had defeated his opponent 3-1 in the Italian Open quarter-finals, and repeated that feat, despite losing the opening game (6-11, 11-5, 11-4, 11-3). The final was against Lahourcade Guillaume, the number one seed from Belgium, currently number two on the European rankings. Mark was always up against it and never in front during the match, but he kept clawing back to take the match to a fifth and final set. However, the Belgian proved too strong and ran out a 11-9, 10-12, 11-8, 12-14, 11-5 winner. 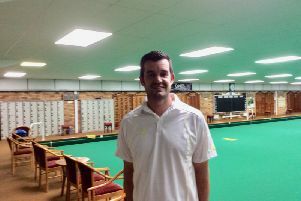 Mark has also been selected for the England Masters team for the second consecutive year, this time at over 50 level for the Home Internationals against Ireland, Wales and Scotland in Nottingham on May 8-9.